Stinging nettles are really delicious, but before consuming it is important to take out the sting. The key to neutralizing the stinging agent is to use moist heat (either blanching or steaming) to lightly cook them before touching or consuming them. Once the the sting is gone, fresh stinging nettles can be used in salads, nettle pesto, ravioli fillings, in sauteed dishes, or cooked further in other recipes. 1. Wearing gloves or using tongs, rinse the nettles in cold water. 2. Blanch the nettles in boiling water for 60-90 seconds. 3. Drain the nettles in a colander. Run cold water over them to cool them to room temperature. Press down on the nettles to squeeze out all the water. 4. In most cases you should chop the nettles before adding them to whatever you are cooking. 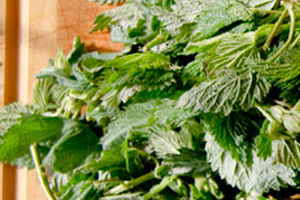 Without chopping the nettles before putting them in the food processor to make nettle pesto, for example, the nettles may add a stringiness to the dish. Certainly chop the nettles before using them in a saute or other dish where you don’t want big long nettles hanging from your fork. Now that you have gotten the sting out, here are some great stinging nettle recipes.